A number multiplied by the same number is a square root number. If we multiply four times itself: 4 • 4 = 16. Four is the square root of 16. 16 is the squared number of 4. The √ math symbol, a radical sign, designates square root numbers. Square root numbers can be positive or negative. A positive root is the principal square root. An integer squared has an integer result and is a perfect square. Instead of writing radicals mathematicians often use exponents. An exponent is a superscript number written to the right of a base number. The index of a radical is a superscript at the top left of the radical sign designating the root. An index of 2, a square root, is assumed if no superscript number is written. There isn’t a formula for simplifying square roots, it is a math method. To simplify non-prime integer values larger than 100 the following method is used to reduce the larger value into smaller number multiples. Without a square root numbers table we must pick a value between 2 and 3, then multiply the value times itself until the correct answer is discovered. The result of 6.25 is greater than 5 so the √5 is less than 2.5. It’s getting closer to 5. It is easy to see that it can take many attempts to find a number value that when multiplied by itself would equal its original prime square number value. 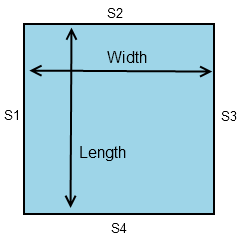 Square area is one of the most important math measurements. It is a flat surface measurement. Let A = area, L = length and W = width. A = L • W where L = W and, L and W are perpendicular. It means that for any object to be square the width and length must be exactly the same size. If length is one meter then width is one meter, if width is 12 inches then length is 12 inches. It also means that for any square object the square root of its area is exactly the length or width of that object. Related to area is perimeter. It is the outer boundary of an area. Perimeter is an outline that exactly shows the extent of an area. Think of perimeter as a fence that completely and exactly surrounds an area. The measured length of the entire fence is its perimeter. 24 • 30 = 720 square area of floor. 720 Sq. Feet / 1 Sq. Foot Tile = 720 Square Tiles. A minimum of 720 tiles is needed to completely cover the floor. This formula calculates the length for any side of a right triangle or its hypotenuse. To use the Hypotenuse Formula the lengths for two sides of a right triangle must be known, or the length of any side and the hypotenuse must be known. The area of a right triangle with equal length sides is exactly ½ the area of a square with sides the same length as the triangle. “C” is the hypotenuse. “A” is the adjacent side and “B” is the opposite side. The intersection of lines A and B form a 90° angle. The adjacent and opposite sides are equal length. The right triangle has an area 1/2 of its corresponding square. Squares have been drawn so that one side of each square is attached to the adjacent, opposite and hypotenuse of the center triangle. Now think about the Hypotenuse Formula given above as C2 = A2 + B2. The area of each square A, B or C is its length multiplied by it width and because A, B and C are each a square their lengths and widths are the same. The area of square A is length A multiplied by width A, and can be written mathematically as A2, the area of square B is length B multiplied by width B, and can be written as B2, the area of square C is length C multiplied by width C, and can be written as C2. 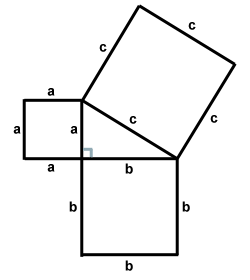 For any values assigned to a side of square A and side of square B their square areas added together (A2 + B2) always equal the area C2, this provides a mathematical proof for the Pythagorean Theorem that √C2 = √( A2 + B2). Since C2 = 25 the √25 = 5 and is the triangle’s hypotenuse length. Diagram showing math proof of Pythagorean Theorem using squares and square roots.